Do you have the six business systems shown below under control with staffing, policies, procedures, processes, growth strategies, and positive results? 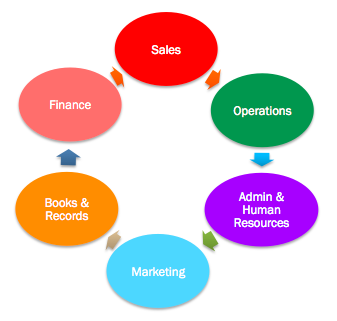 Together, they make the organization efficient so that you have a stable, profitable business. Six interrelated systems of any successful business. We guide owners how to make them work together. We use our propriety assessment of the eight stages of growth to determine where the business is, what it has completed, and what business systems each client needs to focus on at that point in time. Then, we go to work on the business to get it done. Our growth program requires taking the 40,000 foot owner’s view and thinking ahead in terms the impact of any decision or action. It takes owners who have a high desire and willingness to do what’s necessary to move ahead. When all the systems work together correctly, they create consistency, stability, and the potential for expansion. They make things easier. They increase the value of your total investment in your business. They make life better for all your stakeholders and you! Clients tell us they are relieved to have a partner to get things done and they wish they’d started working on this years ago. You can start now by contacting us now for an initial financial and marketing review and plan to improve your business future.